A window into the unexpected discovery has been left in the Kitchen. We just found out something new about 100-year-old Pittock Mansion! Recently Pittock Mansion commissioned Architectural Resources Group, LLC (ARG) to conduct a detailed survey of the Mansion’s current preservation needs and priorities. From tile roof to basement, ARG’s specialists gathered information on the current state of the structure. ARG explored the Mansion’s many crawlspaces, utility rooms, and the expansive attic. Some investigations required controlled removal of sections of pipe or cuts into the walls to gather information. Historic documentation about the construction of Pittock Mansion is incomplete. Ambiguity in original building plans led us to believe that nearly 2-foot-thick concrete walls support the home’s sandstone veneer. ARG’s probes discovered otherwise. The Mansion’s basement level is indeed constructed of concrete, but the exterior walls of the top 3 levels are brick masonry – a secret the Mansion has kept for a century! This discovery affects the preservation recommendations ARG will make. ARG’s full report will be completed and presented to the Board in September. 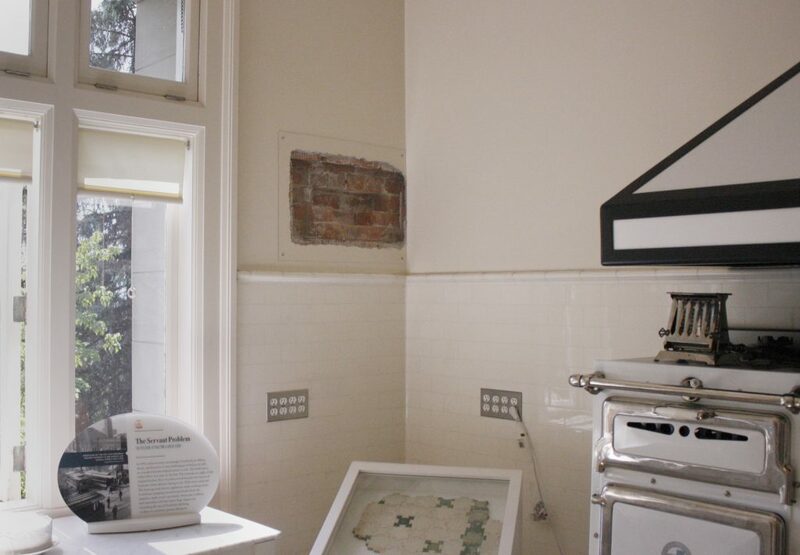 As a window into this unexpected find, a test hole showing the brick and tile wall interior, has been left open in the Kitchen to educate visitors about the many surprises and challenges of historic preservation.